Konkani song of which Goan Song is a preeminent branch is a treasury of the traditional music of the India subcontinent containing as many as 34 identifiable types of song. They include the monophonic and harmonic varieties the former in existence before the Portuguese brought western music into India, and the latter consequent on the western impact. It was in Goa that Indian musicians first began to compose in western musical forms incorporating into them motifs and nuances of their own immemorial tradition. 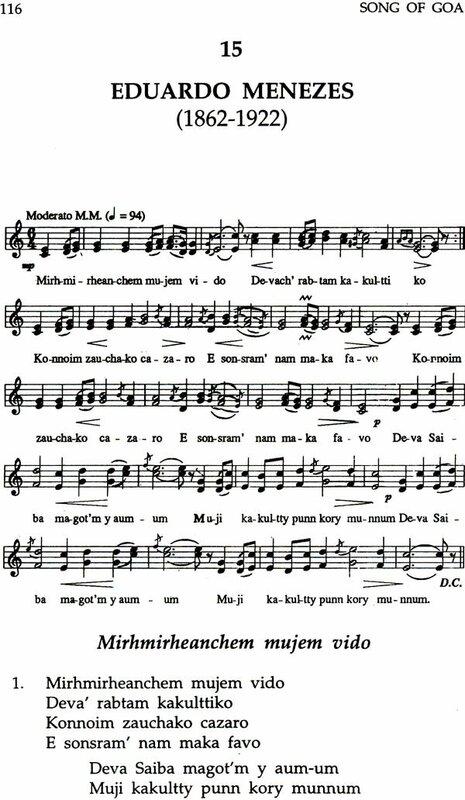 Among the 34 types figures the Mando a dance song typically consisting of quatrains, frequently having appended choruses, set in six-four time. Its main themes are love and events (fobro) the latter social and political in nature. But its favorite theme is love oriented toward marriage where the lover yearns for union with his beloved achieves that union or laments at his failure to realize it. The love Mandos are thus of three types: yeaning (utrike, the theme of this book), union (ekvott) and lamentation (villap). The melody of the mando is uniformly melancholic but it scintillates with luminous imagery as of suns, stars, flowers and diamons. The Mando evidently originated in the 183s, but its period of high achievement extents from around 1870to 1950. it was given expression to by numerous composers, of such four are particularly remarkable: Paulo Milagres Silva (1855-1931), Arnaldo de menezes (1863-1917), Gizelino Rebelo (1875-1931)and Torquato de Figueiredo (1876-1948). As a dance the Mando, India ballo noblie, was the last aristocratic social dance created anywhere. Goans not only initiated the Westernization of Indian music, but, from the late 19th century also pioneered in Indian ethnomusicology, providing a model for the preservation and interpretation of the rich folk music of India. The present work aspires to represent that model. Jose Pereira Born in Bombay in 1931, B.A. (Hons) in Sanskrit, University of Bombay (1951) Ph.D in Ancient Indian History and Culture, University of Bombay (1958) Adjunct professor of East-West Cultural Relationships at the Insituto Superior de Estudos Ultramarinos, Lisbon (1959-1960). Research Fellow in the History of Indian, art School of Oriental and African Studies, University of London (1962-1966) Professor of Theology, Fordham University, New York (1970 to present). Pereira has published 14 books and over 130 articles on theology history of art and architecture and on Goan and Konkani culture language and music. Micael Martins (29 October 1914-9 February 1999) Born at Ol-lli/Orlim, Goam in 1914. studied music in Goa and in Bombay with renowned societies in Bombay and Delhi and directed musical groups like the Coro Sacro and the Micael Martins String Quartet. Conducted the opera Geisha (1953). Was orchestra leader of films (Films Division Orchestra, 1949, Rajkamal Kala Mandir Orchestra, 1949). Participated in concerts in Delhi, where in 1962, he performed alongside Lata Mangeshkar and Mohammed Rafi and in 1972 at the inaugural function of the Delhi Symphony Orchestra. Martins began his research into traditional Goan Song in 1933. Collaborated with Jose Pereira in recording Goan songs from 1956, collecting as many as 11,000 numbers. Martins and Pereira published some of those songs in Marg (1954) and Goan tribune (1956-1957). They also published monographs of Goan Song in a Sheaf of Deknnis (Bombay: Konkan Cultural Association, 1967) and “song of Goa. An Anthology of Mandos Braganca, no 28 (1981). Martins was a prolific composer of classical and art song into his compositions. He composed masses, hymns, profane songs and instrumental pieces- particularly excelling in the latter, outstanding examples of which are the following: Rapsodia (1952), Carnaval em Goa (1953). Quatro Aguarlas (1953), Crepusculo de Estrelas Moribundas (1960) and Festival (1971) Micael Martins is renowned as the greatest classical composer in the history of Goan music. Cover Design: by Teresa Pereira, shows figure of mando dancer in torhop baz (watercolor by Jose Pereira). This book owes much to many people but most of all to our informants, listed in Appendix 3, provided us with much of our information on the Mando. Most of them have passed away and with them the ago of the Mando has passed into history. We also wish to acknowledge our debt of gratitude to the Instituto Cultural de Macau, for furnishing us with the score of the Mandos, and to the Fundacao Oriente and Cosme Matias Menezes Limited for sponsoring the publication of the book. Victor Rangel Ribeiro kindly corrected the errors in the next and score. George Coelho David Menezes and Paulo Varela Gomes gave us much encouragement in the course of putting the book together for which we owe them thanks. And finally, Brij Mohan Pande gave us his usual unflagging support during the time that the book was in production for this no words can adequately express our gratitude.